This patch solves conflicts and remedies inconsistencies when using Campfire, Hunterborn, Frostfall/Hypothermia, and iNeed/Realistic Needs and Diseases together with Requiem, allowing them to work rather seamlessly together. USLEEP/CCF/WAF/CCOR keywords/fixes applied. While I've been given permission to release this patch, none of the contents of the original mods are mine! Therefore I can give no permissions regarding the contents of this patch, so if you modify it, do it for personal use only please! Segregated changes made to Frostfall, Hunterborn and Realistic Needs and Diseases to separate plugins. Added all-in-one plugins for all viable combinations of Campfire, Frostfall/Hypothermia, Hunterborn and iNeed/RND (USLEEP). Rebuilt food edits to be more consistent across modded and vanilla food items; all of the different RSE plugins contain these. 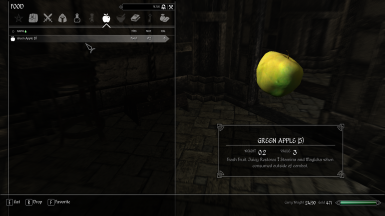 Added a plugin to revert food items to their normal Requiem states; not available for RND editions. Injected all plugin-native forms into Update.esm for the sake of simplicity (and my sanity). Added appropriate perk requirements to all applicable recipes from Campfire, Frostfall and iNeed. Integrated messages from Tooplex's Your Own Thoughts patches for the parent mods. Removed numerous unnecessary edits that are now handled by Requiem - Hearthfire (mostly milk-related). Rebuilt Frostfall/HB Stone Arrow variations for Campfire/HB editions. Reused the (now injected) Hunterborn/RND waterskin recipe to provide utility to the Hunterborn-added Animal Bladder in iNeed versions (as an alternate waterskin recipe). Fixed minor error in FOMOD installer. Updated bow keywords and speeds for Requiem 1.8.2. Integrated new arrow tweaks, more Requiem-friendly. Heavier arrows are slower and fall faster. Stone arrows have seen a damage increase; perfect stone arrows are a little better than steel; to compensate, they are now heavier. Hunting bows now use an iron ingot instead of steel (consistent with their placement below Imperial bows), and 1 leather strip as well (consistent with item appearance). Crafting bows has changed a little. Bows now require 3 or 4 hide lace to craft; heavier bows need sturdier bowstrings. Frostfall's portable tanning rack can be crafted at the forge or via the Survival menu. Frostfall's portable tanning rack no longer requires Craftsmanship or a forge to craft, but now costs an additional two leather strips as well. Bone arrows have also seen a slight damage increase, keeping them positioned below stone arrows. Minor weight fixes to certain ingestible items. Switched assets from BSA to loose files. 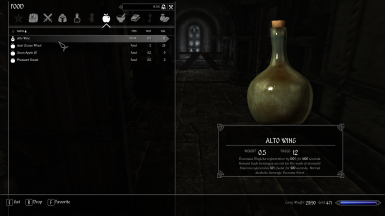 Added correct or missing effects to alcoholic beverages that lacked them (dragon's breath mead). Implemented the fixed RND scripts and integrated them into the main download. Download is now all-in-one with both RSE versions and the Unique Booze Bottles patch available via FOMOD installer options. Adjusted Hunterborn weapon values to better suit the survival aesthetic. Adjusted critical values for new Hunterborn weapons (and the Mammoth Bone Club). Fixed the bone sword's EditorID. All ingestibles reworked. Stamina gain from food is now consistent across all foods dependent on meal size and water content. All food and drink effect descriptions now have consistent ordering. New Hunterborn-added foods use Hearthfire milk (henceforth called "RSE milk") for consistency. Caught those last few RSE recipes that were still using RND milk. New Hunterborn-added weapon recipes require Craftsmanship. Reqtified new Hunterborn weapons. Masterwork weapons are slightly lighter and have better damage. Masterwork bone bows are treated as light bows positioned between hunting bows and elven bows. Both new Hunterborn bows are breakable. Take care of them. Added "Power Food" effect to new Hunterborn foods where appropriate. Added new Hunterborn soups and stews to appropriate formlists for Frostfall exposure resistance. For consistency with Requiem, rare hunting knives have been completely removed from their respective leveled lists. Regardless of MCM settings, glass, ebony, daedric and dragonbone hunting knives will not be added to merchant inventories. Consistent with Requiem, water in bottles is now 'Bottled Water'. As with waterskins, the description can tell you more about the contents, and the weight indicates the quantity. Instances of Requiem's "Bottled Water" have been replaced by "Bottled Water" items (RND's "Spring Water") in leveled lists. The new entries vary in size between the three bottle types. Hand-placed versions have been replaced as well. There's no variation here, they all use the large bottle (same mesh used by Requiem). Fixed a few old recipes with duplicate (or even '0') quantities for required ingredients. Adjusted bone arrow recipe. Bone arrows now use six bits of bone for a dozen arrows. Added alternate stone arrow recipe using animal bone for shafts in place of wood. Two animal bones will yield 12 arrow shafts. Adjusted new mass-production recipes for bone arrows. 30 bits of bone, 5 firewood (or 10 large animal bones), and Craftsmanship required. Creates 60 arrows. Created new mass-production recipes for stone arrows. 5 dense stone fragments, 5 firewood (or 10 large animal bones), and Craftsmanship required. Creates 60 arrows. Tweaked the yield of certain recipes, as well as the weight of a few raw meats. Renamed Frostfall spellbooks, scrolls and magic effects to remove numeric labeling. Wolfskin and Soothing spells now use "Lesser" and "Greater" prefixes to distinguish their potency. Tweaked the new Hunterborn projectiles to match up with RSE (and my WAF patch). Adjusted old Hunterborn weapons. They're a little lighter, the damage remains about the same. Item values need tweaking, fixing in 1.96. Removed Cruel Bone Arrows recipes. All other bone and stone arrows remain craftable. [HT] Fixed stone arrow variants not being "Reqtified". Thanks melty. Stone arrows now build in batches of 10 as bone arrows do. This serves both to promote use of both ammo types, and to balance quality vs. availability of materials. Stone arrows now have Requiem gravity applied. Bone weapons now require Craftsmanship. Trying to craft a makeshift weapon that would probably just fall apart on you will get you nowhere. Bone, stone, and iron arrows now require Craftsmanship. Crafting an (even semi-effective) arrow really isn't easy, and should require basic knowledge of what you're doing. 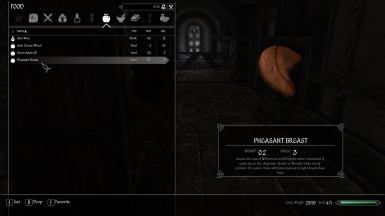 Recipes for breaking Hunterborn pelts down into Frostfall 'cleaned pelts' also now require Craftsmanship. Damage for Frostfall vs Hunterborn weapons has been reworked once again. Stone now bests bone (by a slight margin). Bone bow damage is now reasonable. Frostfall's stone arrow has joined with Hunterborn's scrimshaw to create something beautiful. Stone arrows, like their bone cousins, now come in multiple qualities that scale with Hunterborn skill. Due to this change, stone arrows are now found in the Scrimshaw menu. Overhauled Hunterborn poisons (and crafted poisons) to make them viable for Requiem, even comparable to most SIC spider poisons. Fixed animal bladders not being properly distributed in RSE-Basic. Remedied any remaining missing materials. [HT] Replaced Hunterborn's "Dragon Heart" with its Hard Times equivalent. [HT] Hunterborn's dragon blood items now take precedent. The Hard Times version is still accessible, but only to the most skilled alchemists. Pelt values corrected and will now always scale with Hunterborn skill. Pelt 'type' names now have consistency. Removed duplicate Deer Pelt > Leather breakdown recipe. Re-Reqtified bone and stone arrows. This time it's a perfect fit. Completed the milk overhaul. All handplaced instances of milk are now consistent, as are all recipes requiring milk. Removed milk conversion recipes. Never again turn milk into milk. Added missing CCO injected global that was hiding Frostfall recipes if CCO wasn't installed. RSE still does not require CCOR, though it's highly recommended. Reworked recipe outputs for consistency across both versions. Revised stew recipe requirements and increased the output from 1 to 2 to justify the ingredients. Bone and stone arrows now build in batches of 12 as Requiem arrows do. Bowstrings! Sinews (Hide Lace) are now bowstrings for any of the basic bows (Longbow, Hunting Bow, Bone Bow) instead of leather strips, because this makes sense. RSE weapons and arrows now do their correct damage for 1.8. Updated Frostfall-added armor ratings for fur armors for consistency with Requiem. Updated Frostfall and Hunterborn-added weapons for Requiem 1.8. Changes to stone arrow speed and gravity in line with (my) upcoming WAF combo patch update. Updated for Axonis' final 1.26 patch. Took his rebranding of 'milk' a step further for consistency. Recipes now use Hearthfire milk. Milking cows now gives Hearthfire milk. Milk sold in taverns is now Hearthfire milk. Consistent milk. Milk is now milk whether it's Hearthfire, RND, or Requiem milk. ITS EFFING MILK. Fixed duplicate 'drunk' effects in active effects menu. 'Spiritedness', the proper name for the Requiem effect, is now shown. Overhauled RSE materials lists. Hunterborn will now properly distribute all the materials I wanted it to. Reworked RSE-HT materials. They'll appear at their appropriate rates. Readied RSE for Hunterborn 1.4.1. Missing RND Hearthfire recipes addressed. Duration on Requiem 'drunk' visual effect reduced to near zero to avoid overlap with RND. Bottles and beverages now have weights that vary with size, capacity and contents. Honeycomb recipes make sense now; treats made with honey are worth making. Deer pelts now always give 2 leather, with or without CCO. Hunterborn and Frostfall weapons (especially axes) rebalanced. Woodcutter axe damage now degrades slightly as the axe does. Iron hunting knife now requires Craftsmanship, as most items do. Requiem Nutrition bonuses applied to ingestibles. Weights and values reworked for consistency and challenge. NOTE 1: The information on this page is a bit outdated; you no longer require *all* of the parent mods, and can use any single parent plugin, all of them, or even just Requiem with an RSE twist. I'll be updating the page very soon. NOTE 2: These patches require Dawnguard, Hearthfire and Dragonborn, and USLEEP. 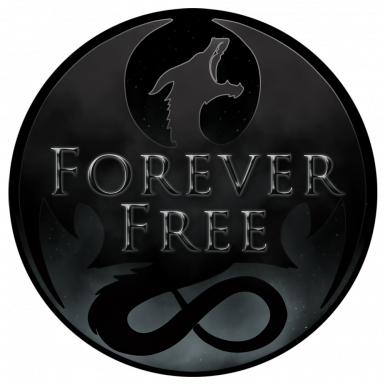 This is an all-in-one survival patch that unites Hunterborn with Realistic Needs and Diseases and Frostfall, for use with Requiem - The Roleplaying Overhaul. With the required mods installed, this is the -only such patch- you will need. It is inclusive of the changes made by Axonis' All-in-One patch, but in many ways modified to better fit with Hunterborn (with minor influences from Azirok's Hard Times) and restore the classic Requiem nutrition bonuses. The patch has integrated fixes/keywords for the Unofficial Skyrim Patch, Clothing and Clutter Fixes, Weapons and Armor Fixes Remade and Complete Crafting Overhaul Remade, for compatibility's sake. RECOMMENDED FOR USE WITH THIS PATCH: "THE FULL EXPERIENCE"
Install the Unofficial Skyrim Patch. For the ultimate Requiem survival challenge! Use this extended installation guide if you will/do use the recommended mods! Install the Unofficial Dawnguard Patch. Install the Unofficial Hearthfires Patch. Install the Unofficial Dragonborn Patch. Install Complete Crafting Overhaul Remade. Install Requiem - Hard Times. Install Requiem - Loot and Degradation Patch. Install Flora Respawn Fix ("Harvest Overhaul 2_8 and Flora Respawn 2_x optional" version). Install Dynamic Things - Enhanced. Install Perseids Inns and Taverns - Realistic Room Rental Enhanced. Install COR - Crafting Overhaul Reqtified. Install CFR - Cloaks For Requiem. Install RSE's Hard Times version (this patch). Install RSE - Harvest Overhaul Creatures - Hard Times. For best results, don't use a Bashed patch with this patch. However, if you absolutely must make a Bashed patch, make sure to uncheck the 'Import Names' and 'Import Stats' boxes, and definitely use the TES5Edit Script: Unlevel (or Re-Level) Leveled List by fireundubh to keep leveledlists unleveled; you will likely also have to edit these leveled lists manually with TES5Edit to remove items of certain qualities (glass and ebony items aren't common in leveled lists, and daedric items are absent entirely) in accordance with Requiem. This is why I suggest instead using a properly-designed patch for Requiem. For starters, enable everything. If there's a box you can check, check it (except the compatibility page). Be sure to SET YOUR HOTKEYS! It's much more immersive and much less troublesome. Disable RND's eating animations if using the Animations mod. Disable travel gear in favor of Frostfall's. You will have to invest a little extra time to configure this one. Eventually I hope to have a fully-configured preset suitable for posting here, but I lost my saved settings some time ago. Disable Geared Up (at least until Dragondude updates EO). Disable camera movement on any (or all) animations if it causes issues or looks awkward. Compatible with any mod that doesn't alter food attributes or recipes. If used with a mod that alters deathlists, use the option for combining with vanilla materials. Will come out a little weird (unless you clean the new deathlists of vanilla mats). Last, but definitely not least, Azirok for Hard Times and all his other amazing Requiem patches. A note: If a mod is listed in the credits but not the requirements, it means certain changes were carried over for consistency/balance (or various fixes in the cases of the USKP, CCF and WAF, for the purpose of compatibility). A thank you as well of the modders mentioned above for creating the awesome recommended mods in the "Extended install" for RSE, and to Vallen128 for the banner (I just tweaked it a bit). Thanks for checking out my second Megapatch. If you like RSE and decide to endorse it, you should probably endorse the original mods too (it might seem a little silly not to). Also, if you're a fan of complex weathers and ambient sounds, I might suggest checking out my first Megapatch, known as the Weather and Ambience Overhaul. Finally, while you're here, these are some (mostly) unrelated mods I would definitely recommend.